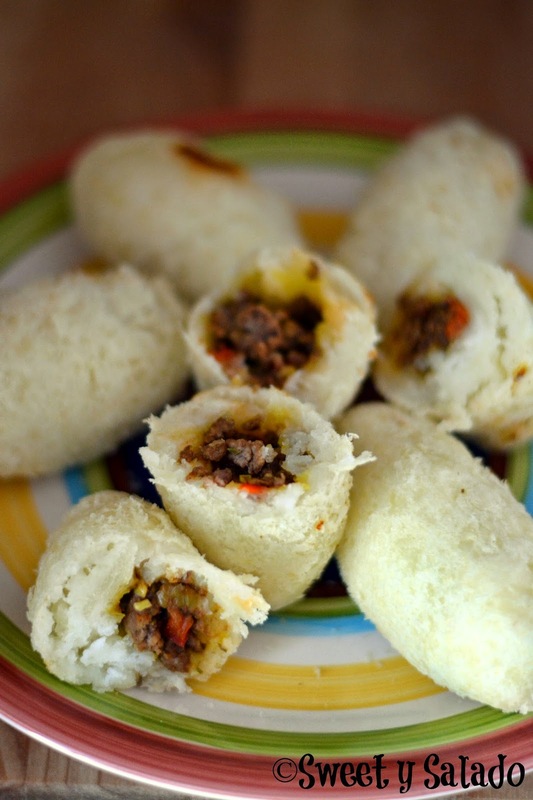 Even though carimañolas, or caribañolas as other people call them, are not very popular in the inner parts of Colombia, they are extremely popular in the Colombian Caribbean coast. Until a few years ago, I did not know what they were and didn’t have the slightest idea on how to make them or what they tasted like. What I did was look for them in my Colombian cookbooks and on the Internet and as soon as I saw that they were made with cassava (yuca), I had to make them. 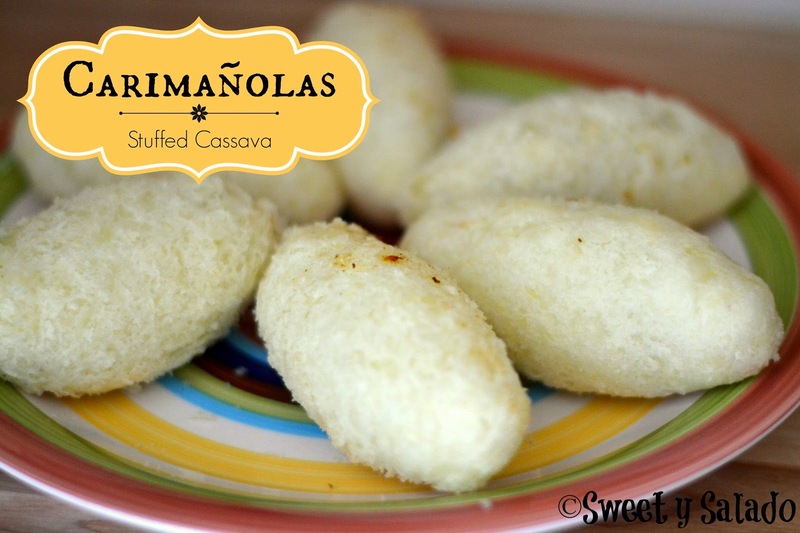 If you have never had these delicious carimañolas, imagine eating a stuffed potato with cassava flavor. 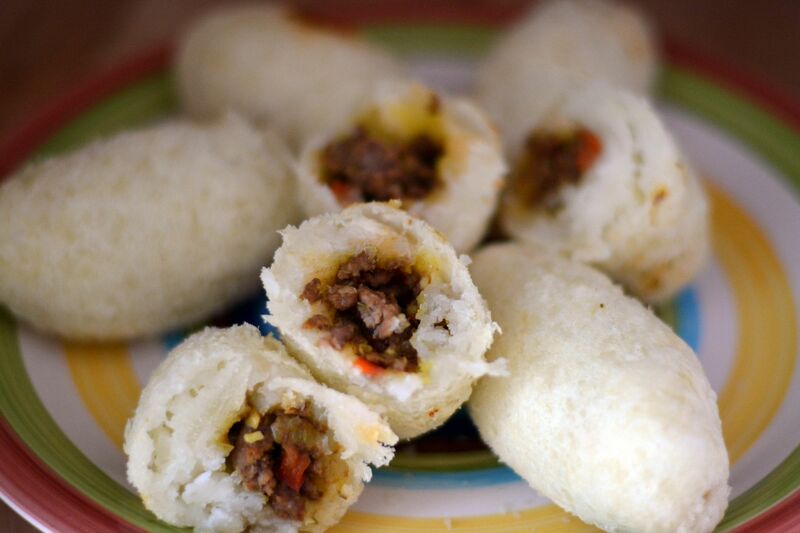 Or, if you love eating yuca fries, imagine eating them with a great beef filling or your favorite cheese. What can be more delicious that that? As many of you may already know, finding good and fresh cassava here in the US can be a bit difficult but frozen cassava works just as well, which is why I always have a big bag in my freezer. For the filling, you can use the one I’m sharing with you in this recipe but you can also use your favorite cheese. Queso costeño or queso fresco (fresh cheese) work amazingly well. Place the cassava pieces in a medium-large pot, cover with water, season with salt, cover and bring to a boil on high heat. Once it's boiling, reduce heat to medium low and cook for about 15 minutes or until the cassava is tender. Drain and set aside to cool. Heat olive oil in a large pan on medium heat, add the white onion and cook for about 3 minutes. Add the green onion and garlic and cook for 2-3 minutes. Add the tomatoes and cook for 5 minutes or until tender. Season with cumin, food coloring, salt and pepper. Now, add the ground beef and cook until no longer pink. Once the cassava is cool enough to handle, remove the vein that is found in the center. If you are using fresh cassava, you can remove it before boiling. Then, mash the cassava either with your hands, a potato masher or passing it through a meat grinder. Taste for seasoning and add more salt if needed. Knead dough until it's smooth and all lumps are gone. To make the carimañolas cover your hands with a little bit of oil to prevent dough from sticking to them, grab a small amount of dough and shape it into a ball. Flatten the ball into a small disc, fold it in half (Like a taco shell) and spoon in about 1 tbsp of the filling. Pinch the top with your fingers to close it and press down on any cracks to seal them. Continue doing this until you make all your carimañolas. Fry at 350ºF (180ºC) for about 5 minutes or until golden brown. Serve with Colombian hot sauce or any fast food sauce of your choice.